Speicher, D.J., K. Luinstra, J. Maciejewski, K.K. Tsang, A.G. McArthur, & M. Smieja. 2019. Clostridioides difficile strain divergence over time. 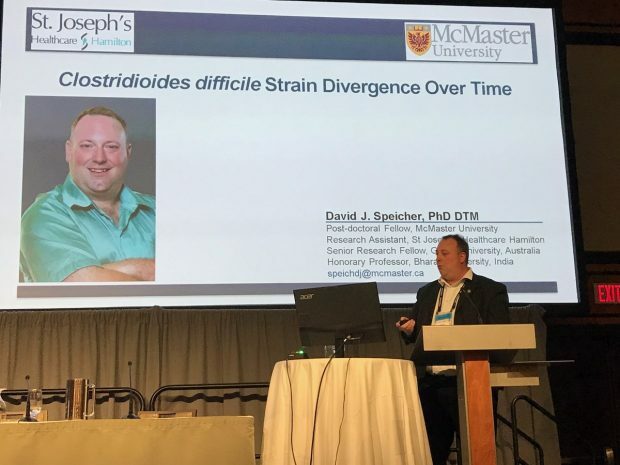 Oral presentation at the Association of Medical Microbiology and Infectious Disease Canada (AMMI Canada) & Canadian Association for Clinical Microbiology and Infectious Diseases (CACMID) Joint Annual Conference, Ottawa, Ontario. Background: Clostridioides difficileinfection (CDI) is a serious hospital-associated infection with severe outbreaks caused by the hypervirulent NAP1/MLST-1 strain. Whole genome sequencing has shown that most outbreak strains are clonal whereas non-outbreaks display a wide diversity of strains. To examine strain diversity in clinical settings, a subset of C. difficileisolates from symptomatic CDI from an acute care hospital were compared to isolates from C. difficilecolonized (CDC) asymptomatic subjects from the same hospital. Methods: A subset of PCR-positive stool samples from clinically confirmed CDI isolates from 2016 (13/110), 2017 (8/111), and 2018 (13/65), and CDC from 2017 (17/185) were cultured 3-times consecutively on CHROMagar™ C. difficile, sub-cultured on Columbia colistin-nalidixic acid (CNA) media, had DNA isolated, shotgun sequenced, and genome assembled for both MLST typing and genome-wide SNP phylogenetic analysis. Results: Based on MLST profiles, the C. difficiletypes detected were diverse. Of the presumed binary toxin positive/NAP1 strains (i.e. PCR tcdA/tcdBpositive) 7/12 (58%) were NAP1/MLST-1 and 3/12 (25%) were NAP7/MLST-11. NAP1/MLST-1 was not detected in any CDC isolate. NAP4/MLST-2,14 were detected in 2016 (n=4), 2017 (n=2), 2018 (n=1), and in CDC isolates (n=3). MLST-42 was dominant in CDC isolates (5/17; 29%) and decreased in prevalence in CDI isolates over time (2016=4; 2017=0; 2018=1). Conclusion: C. difficilestrains amongst both CDI and CDC individuals are highly divergent. Whilst molecular assays are misclassifying 25% of “NAP1” strains, both NAP1 and NAP7 are hypervirulent. The number of MLST-42 CDC isolates is concerning as it has been reported to be the most common strain causing CDI among U.S. adults. This highlights the need for continued genomic surveillance of both CDI and CDC individuals. Genome-wide SNP phylogenetic analysis is currently being performed.